A speaker is a transducing device that converts an electrical signal into an acoustic signal. The sound quality of any speaker greatly depends on the build quality and performance of the speaker. A Naked speaker is one of the fragile device in the audio equipment industry, and also the most important component for producing sounds in any device whether it is a smartphone or big DG boxes. The audio industry is full of different types of speakers and their prices vary greatly, depending upon the quality. To create a sound in any speaker, the Audio power which is an electronic signal passes through electromagnetic, piezoelectric or electrostatic effects, causing the cone or diaphragm to vibrate and resonate with the surrounding air to produce sound. 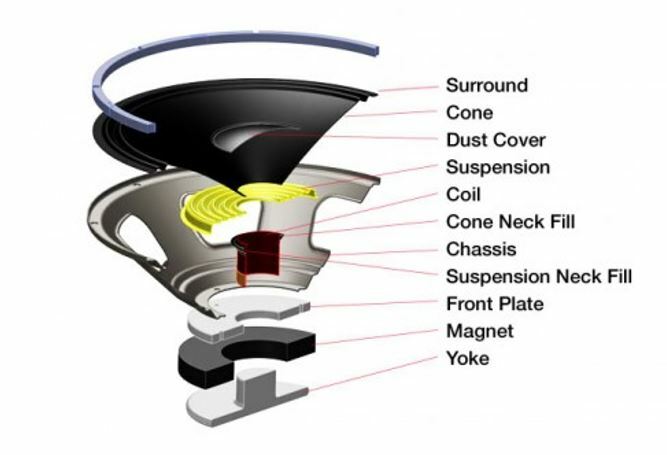 The main components of the general speaker needs to work are Cone, Coil, Magnet, and Chassis. Apart from these core parts we also need few others to create a full-fledged modern speaker. As you can see in the below image, the bottom of the speaker has Yoke which is an iron piece that gives a base to the speaker above that. Around the Yoke, a strong magnet is kept to hold the magnet piece. And above that once again an iron disk with a hole inside is placed. After this, the chassis is attached and then a circular coil generally of thin copper wire is inserted in it, around the Yoke. 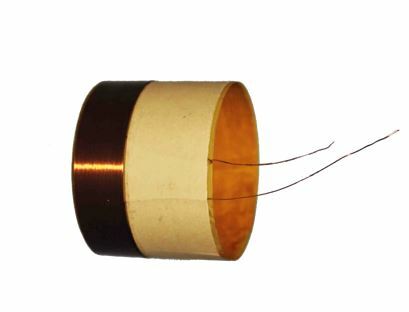 Then the Suspension and Cone paper is placed over the coil from which the two ends of the copper coil taken out those used to provide the audio signals to the speaker. As we know the same pole of a magnet repels each other. When the signals enter into the coil, it starts creating a magnetic field but as it placed inside a magnet piece, and because slight space around the coil and below the Cone; the coil starts moving back and forth, while moving every time it hits the cone (which is kind of paper) it produces vibration, thus the sound we hear. The electric cone-shaped speakers are often used as paper cone speakers in the past. Although the diaphragm is still dominated by paper cones, in 2014 many polymer material diaphragms and metal diaphragms have appeared as we have in our smartphone or headphones speakers. Actually, Conical cone speakers are mainly composed of magnetic circuit system (permanent magnet, core column, magnetic guide plate), vibration system (paper cone, voice coil) and support auxiliary system (centering piece, basin frame, cushion) as we seen above. Let’s delve a bit into it. As we see above the sound produced by the coil which is a very thin copper wire. It is usually wound around several tens of turns around a thin paper, also called a coil, and placed on the column/yolk at The Magnetic Core Placed. When a signal enters the voice coil drives at the Paper Cone to vibrate. 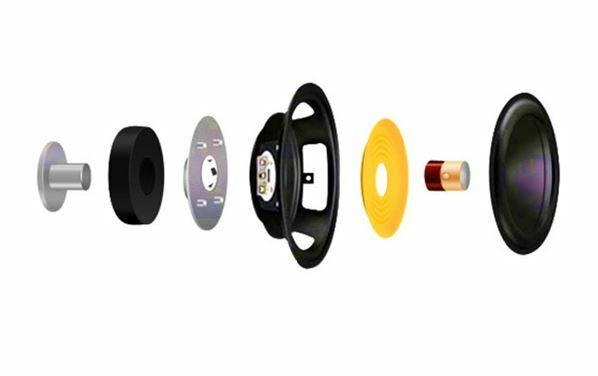 There are many types of materials used for the cone diaphragm of cone speakers. There are two types of natural fibers and man-made fibers. Natural fibers are usually made of cotton, wood, wool, silk, etc. , and rayon is made of rayon, nylon, glass fiber, and the like. Since the paper cone is the sound radiating device of the speaker, the sounding performance of the speaker is determined to a considerable extent. Paper cone is required, it is required to be light in weight and good in rigidity, and cannot be deformed due to changes in ambient temperature and humidity. Folding Ring to fix the Axial Movement of The Paper Cone and to limit lateral Movement at the same time. It acts to block the Front and Back movement of the Paper Cone… In Addition to the material of the paper cone, the material of the folding ring is also bonded to the paper cone by heat pressing using plastic, natural rubber or adhesive. The centering piece is used to support the joint of the voice coil and the paper cone to ensure that it is vertical and not skewed. 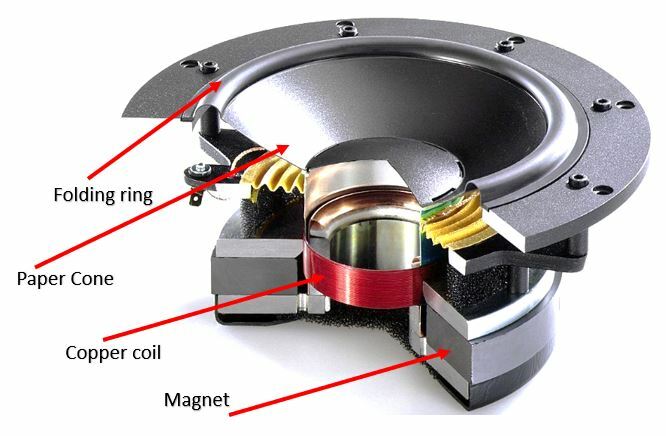 There are many concentric rings on the centering piece so that the voice coil can freely move up and down in the magnetic gap without lateral movement, ensuring that the voice coil does not touch the magnetic plate. 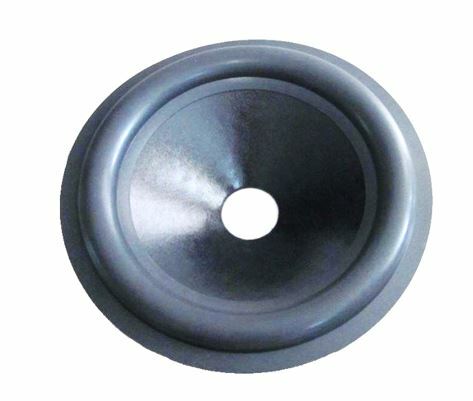 The dust cover on the centering piece is to prevent the external dust from falling into the magnetic gap, avoiding the friction between the dust and the voice coil, and causing the speaker to produce an abnormal sound. (1) The speaker has two binding posts (two leads). When a single speaker is used, the two pins are not positive or negative. When multiple speakers are used at the same time, the two pins have polarity. (2) The speaker has a paper cone, which is usually black in color and white. (3) The shape of the speaker is round, square and elliptical. (4) The back of the speaker cone is a magnet. 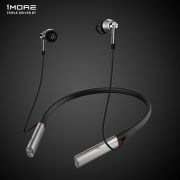 When the external magnetic speaker uses a metal screwdriver to touch the magnet, it will feel the presence of magnetism; the inner magnetic speaker does not have this feeling, but there is a magnet inside the casing. (5) The speaker is mounted on the machine panel or in the speaker cabinet. Low-grade plastic speaker cabinet because of its thin material, unable to overcome resonance; wooden speaker cabinet reduces resonance caused by bass, the sound quality is generally better than plastic speakers. 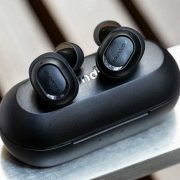 Usually, the multimedia speakers are dual-unit two-way design, one smaller speaker is responsible for the mid-highs output, and the other larger speaker is responsible for the mid-bass output. The selection of speakers should consider the material of these two speakers: the tweeter of the multimedia active speaker is now dominated by the soft dome (in addition to the titanium dome for analog sources ), it can reduce the high frequency with the digital source. The hard feeling of the signal gives a gentle, smooth and delicate feeling. Multimedia speakers are now dominated by softball tops such as better quality silk films and lower cost PV films. The woofer determines the characteristics of the sound of the speaker. It is relatively important to choose. The most common ones are the paper cones, the plastic paper cones, the paper-based wool basins, and the tight pressing basins. The disadvantage of the paper cone is that the moisture resistance is poor and the consistency of manufacturing is difficult to control. However, the top-level HiFi system is made up of paper cones, because the sound output is very average. Good reduction. 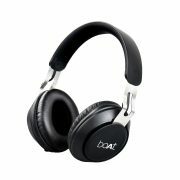 Bulletproof cloth, with wide frequency response and low distortion, is the first choice for those who love strong bass. 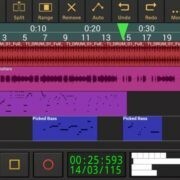 The disadvantages are high cost, complicated production process, low sensitivity, and light music. Wool woven pot, soft texture, it is very good for soft music and light music, but the bass effect is not good, lack of strength and shock. PP (polypropylene) basin, which is widely used in high-end speakers, with good consistency and low distortion, and all aspects of performance are remarkable. 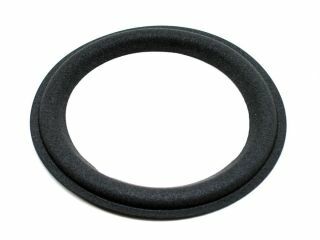 In addition, fiber-like diaphragms and composite diaphragms are rarely used in popular speakers due to their high price. The larger the speaker size, the better. The large-diameter woofer can perform better in the low-frequency part, which can be selected during the purchase. Speakers made with high-performance speakers mean lower transient distortion and better sound quality. Ordinary multimedia Speakers are Mostly between woofer speakers and 3. 5 inches speakers made for performance and have lower transient distortion and better sound quality. Smartwatches vs. Smart bands. Which one to choose for your requirements? What is the difference between 3D Touch and Haptic touch? What is VPN? How To use VPN? Why do use VPN?